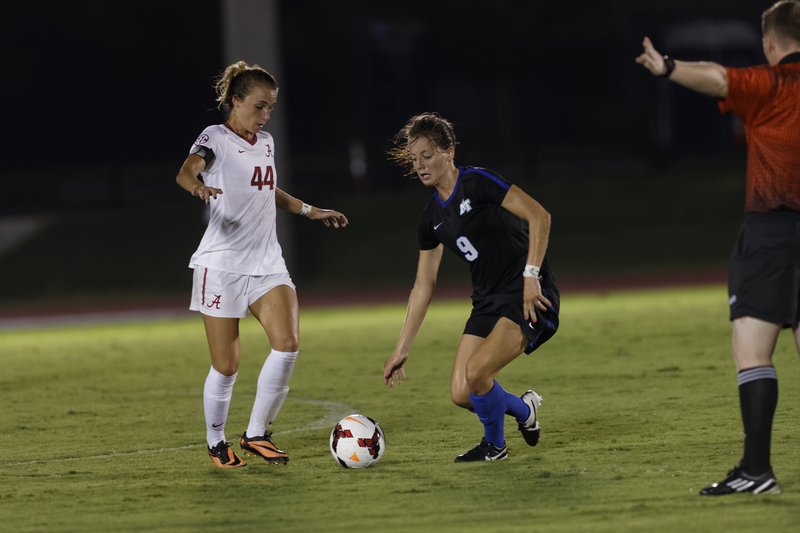 The Blue Raiders tied their soccer home opener in overtime Sunday night against the Alabama Crimson Tide, despite carrying momentum from Friday night’s overtime victory over Lipscomb University. 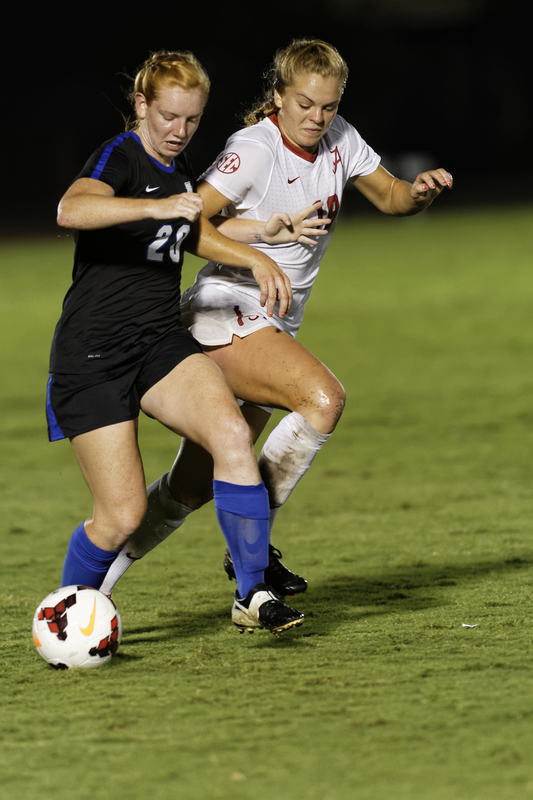 The game resulted in the third overtime game in as many matches, and the Blue Raiders kept the game close with their tremendous defense and the tenacious goal tending courtesy of Kelsey Brouwer. 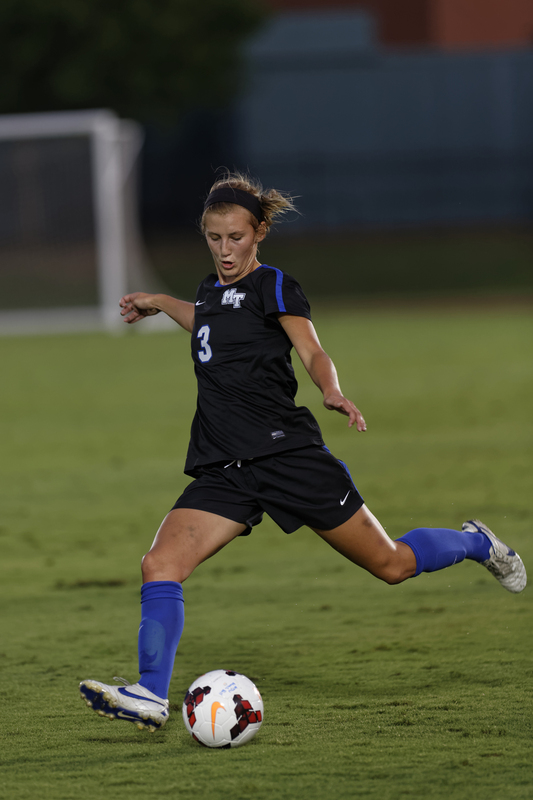 Offense was a different story; the Blue Raiders seemingly could not operate consistently on scoring opportunities. 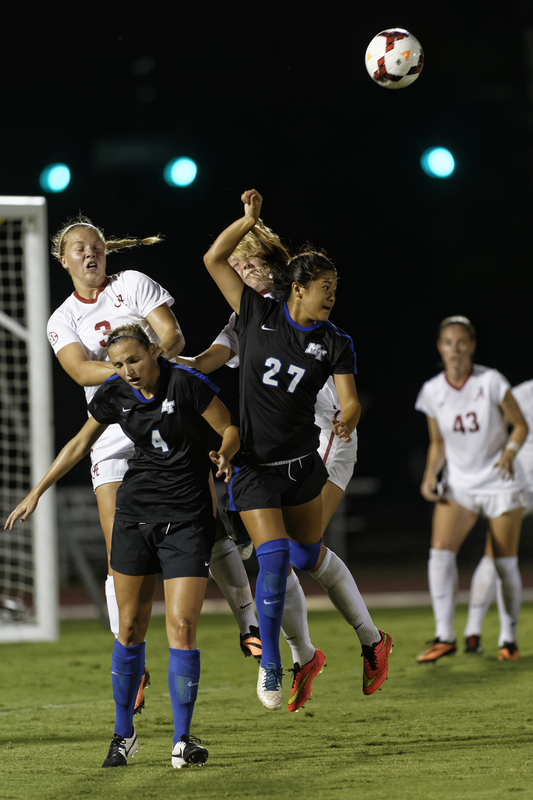 The Alabama offense flowed well early, but the Blue Raiders found away to poke away chances again and again! 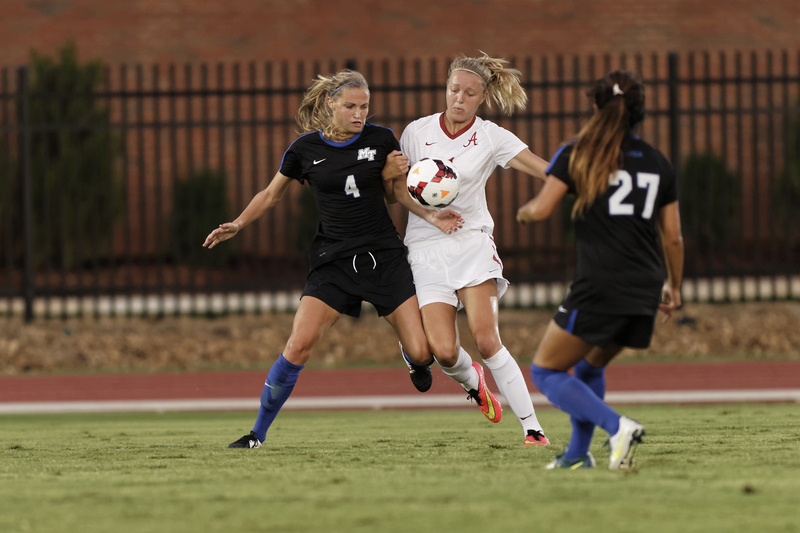 Alabama ended the game with 16 shots on goal, doubling the Blue Raiders eight shots on goal. 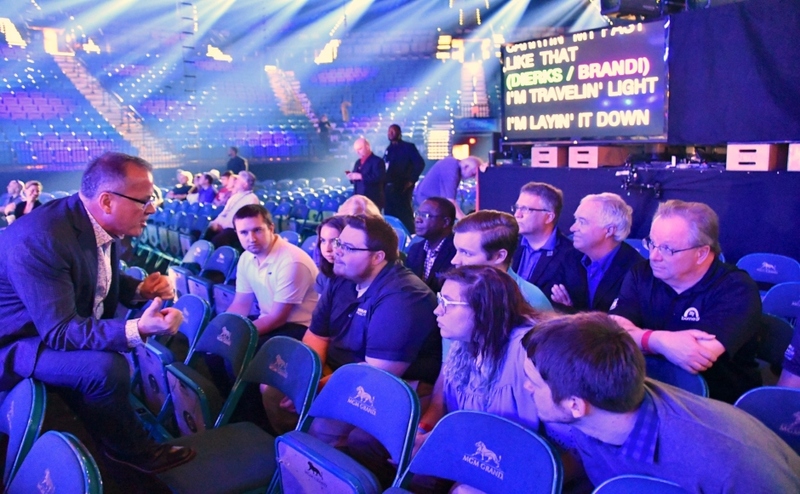 This put a lot of pressure on Brouwer, but she didn’t break despite all odds. 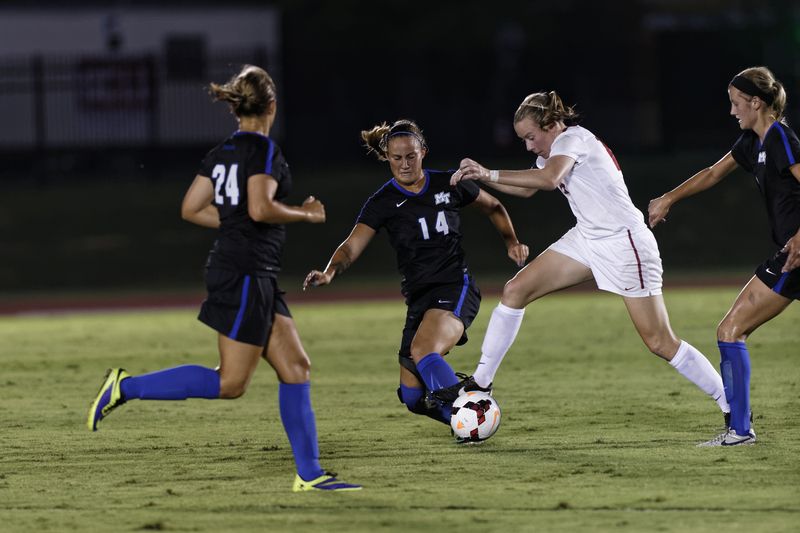 With Brouwer manning the goal, and impressive defensive performances from Emily Jorgenson and Tori Hawkins, the Crimson Tide was held out of the goal until the second half. 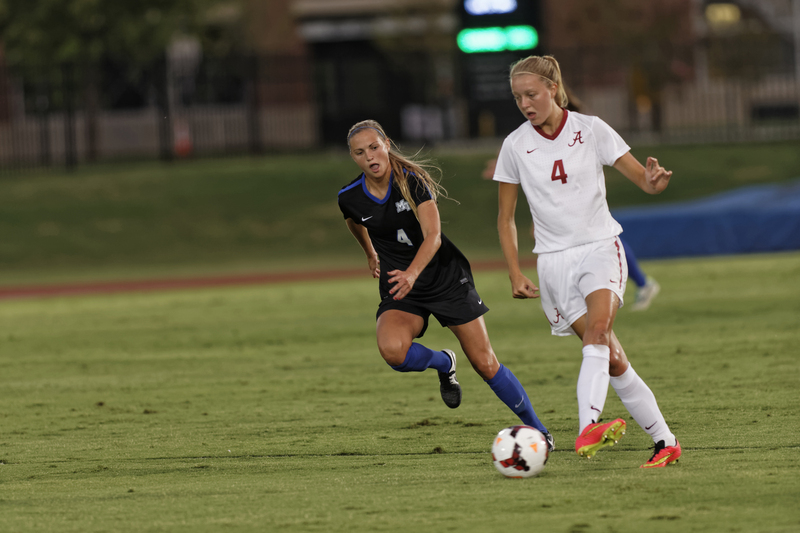 After the start of the second half, the Crimson Tide took advantage of a defensive let down, which ultimately led to an assist for a goal. 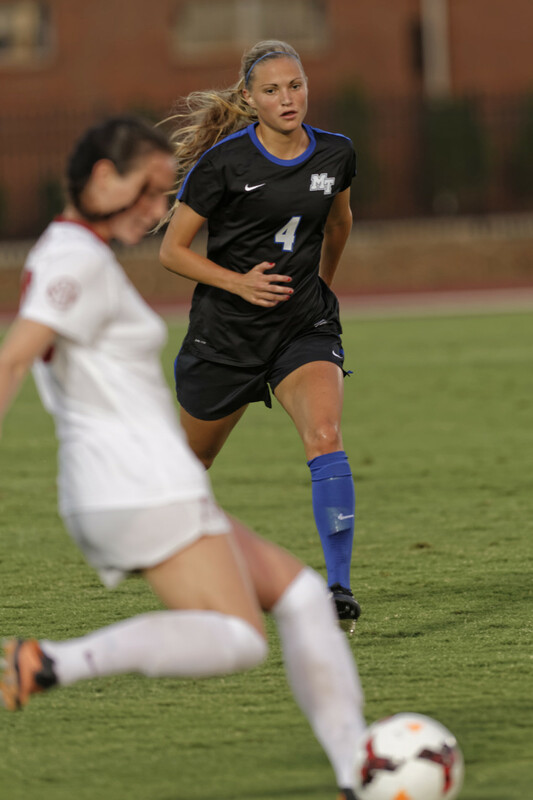 However, the MTSU offense made some quick adjustments and scored right back with a charge down field led by Angie Lai, a well placed assist from Kathy Thomas and the tying shot Summers. 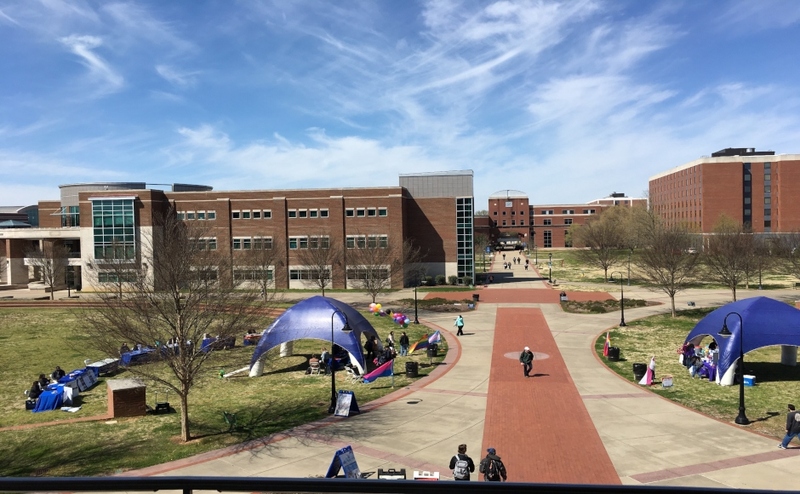 The Blue Raiders took control in the second half with continued protection on defense hustle plays made by Lai and Thomas, and with more offensive fluidity from Peyton McCollum and Summers. 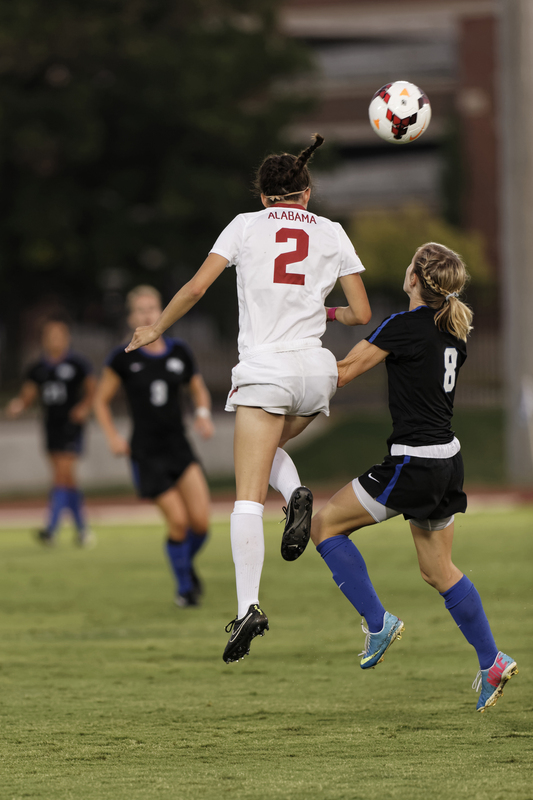 Alabama scored their second goal on a backside pass in near the box. 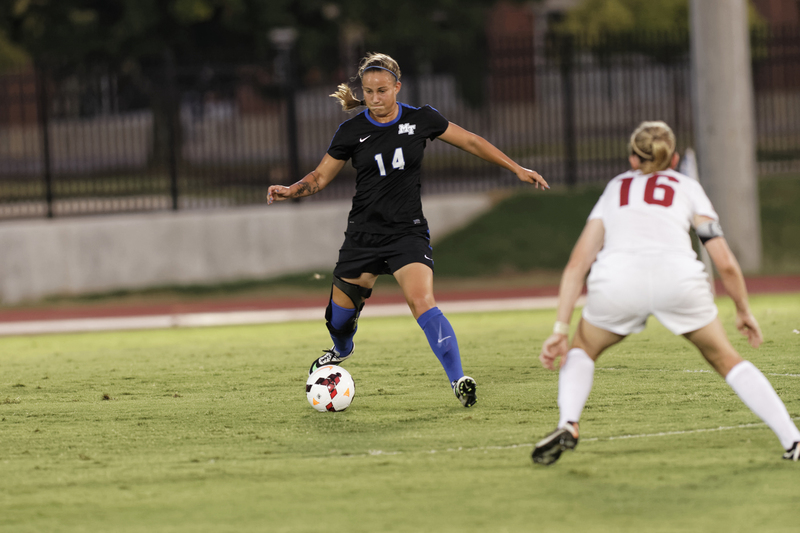 Fifteen seconds later, Summers led the attack across midfield and scored from 35 yards out on an impressive shot. 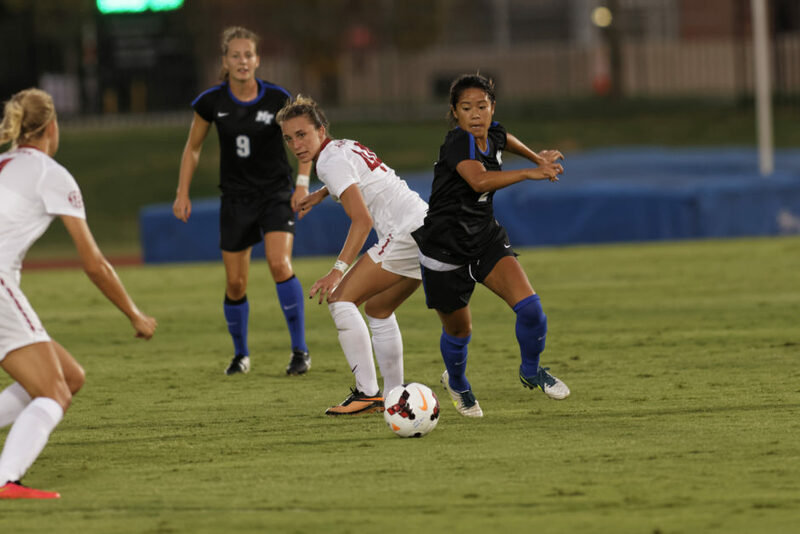 The end of regulation came quick after a heated second half with the score tied at 2-2. 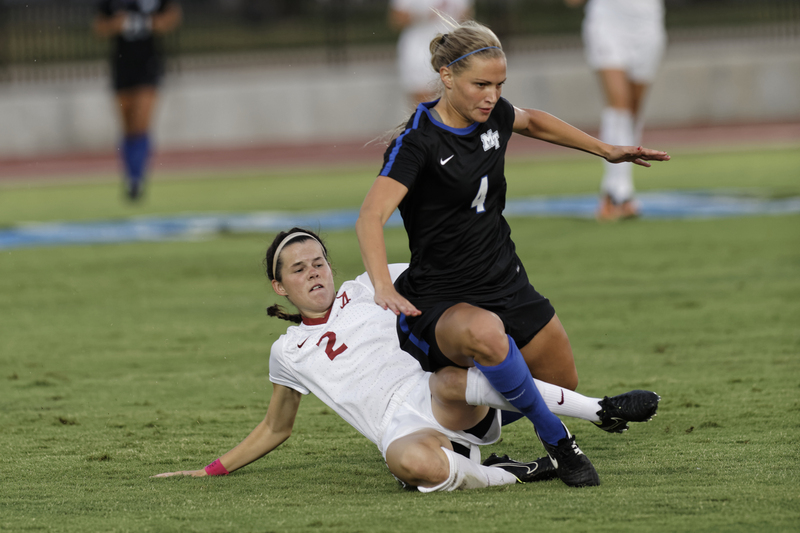 It looked as if MTSU had an edge late with lock-down battles on defense forced by the junior Hawkins. 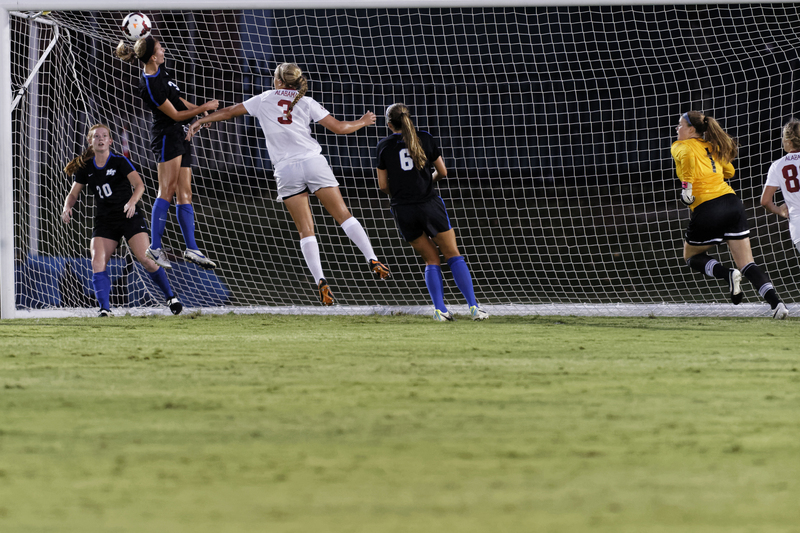 Brouwer continued to make dangerous saves coming out of the goalie box, and offensively the Blue Raiders pushed the ball up field. 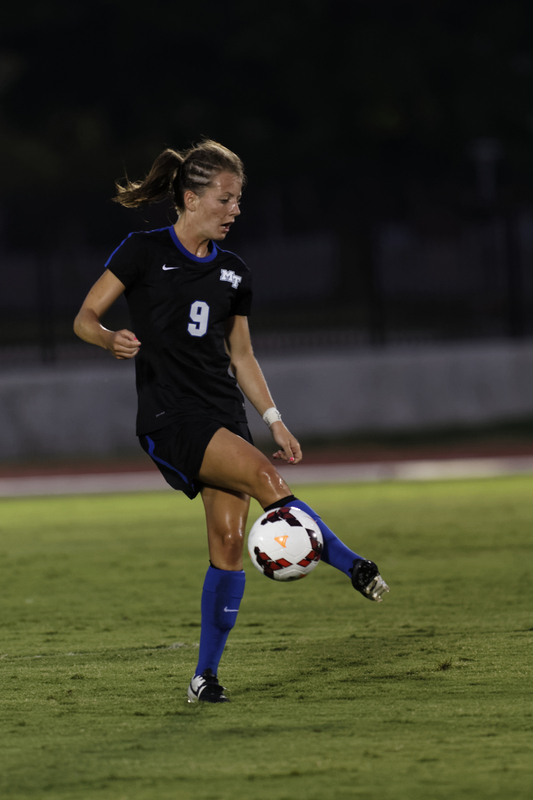 Late in the game the Blue Raiders created turnovers just like they had all game, but this time they started converting that to more offensive chances than previously in the game. 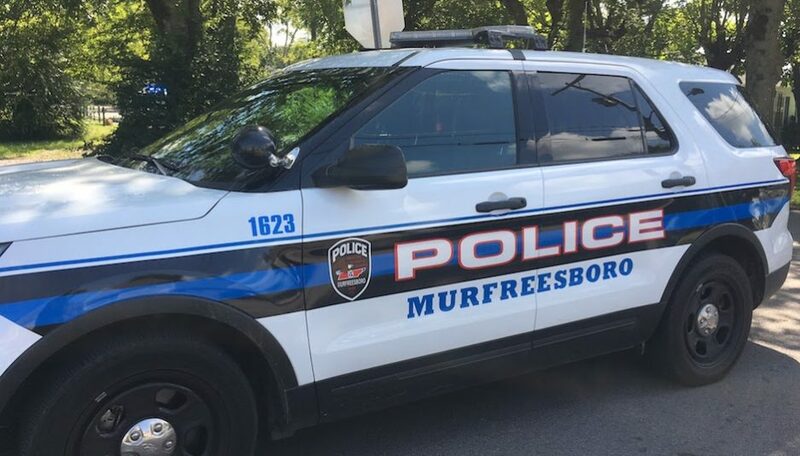 The final score remained tied after the overtime run. 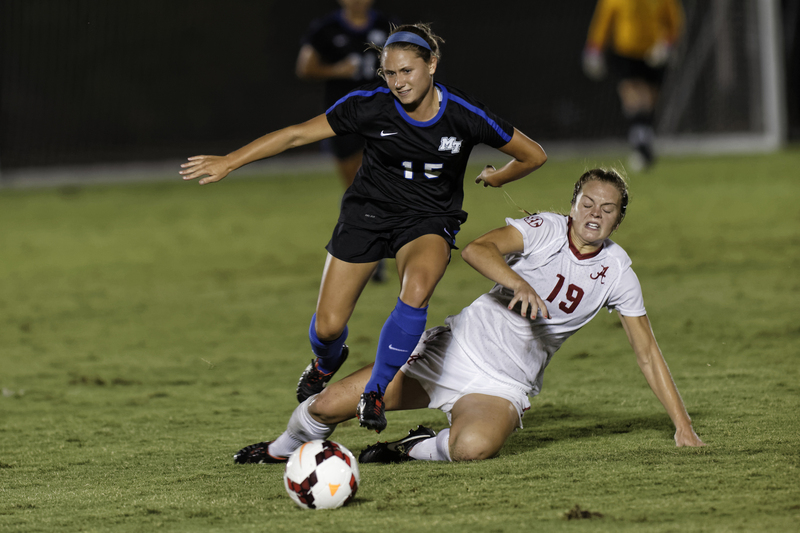 Though the game ended in a draw, Brouwer gained a career-best 12 saves, the fourth highest in Blue Raider soccer history. 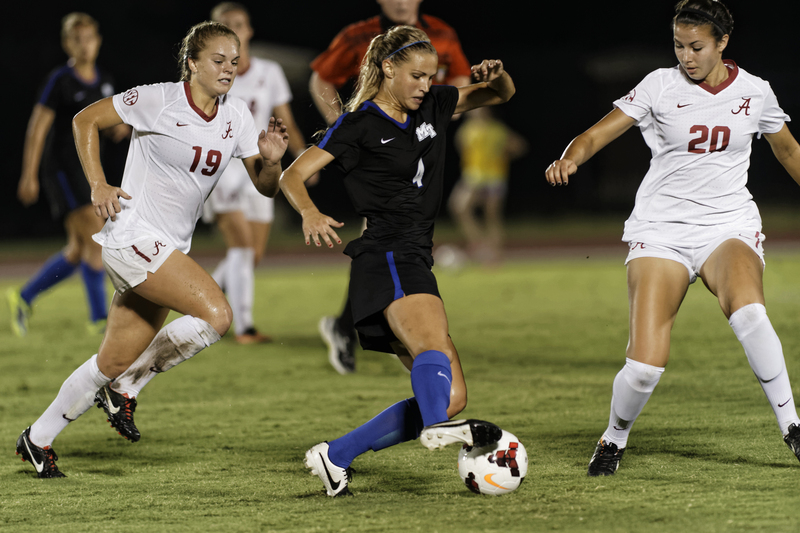 Looking forward, the Blue Raiders are scheduled take on University of South Florida Bulls at 7 p.m. at home Friday evening in the Blue Raider Classic. 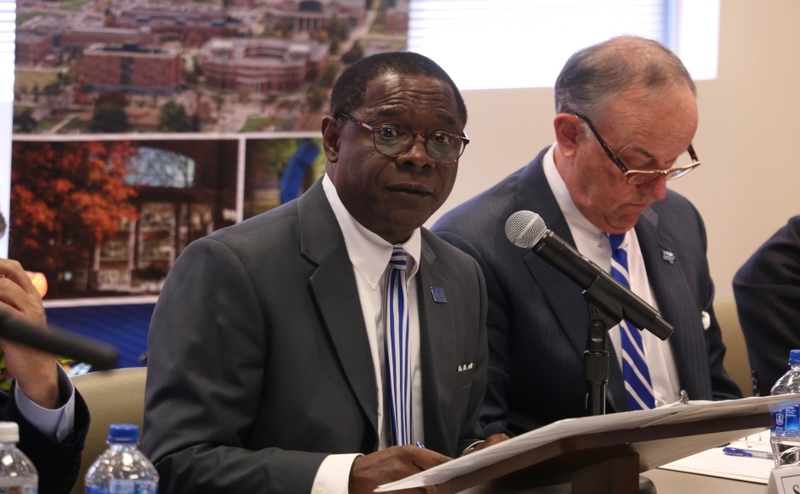 Follow us at www.mtsusidelines.com and on Facebook at MTSU Sidelines or on Twitter at @Sidelines_Sport.